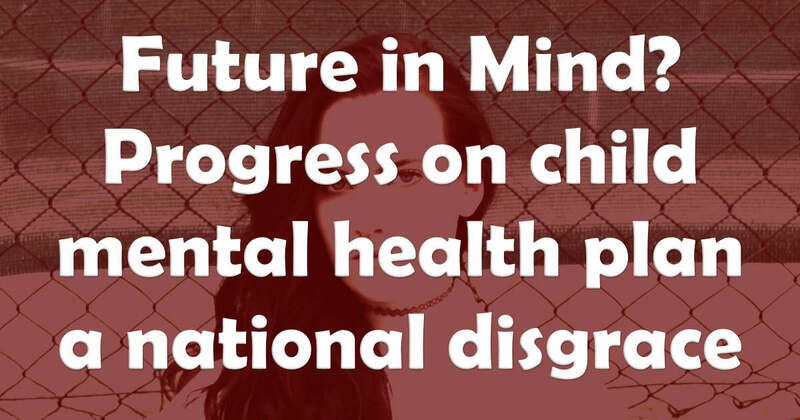 A shocker of a report was published yesterday into the progress on the funding boost to mental health services for young people that we talked about in this post 18 months ago. Back then, the government announced it was improving Child and Adolescent Mental Health Services (CAMHS) by promising an extra £1.4bn over five years. At the time, I wrote that it sounded great if it was actually implemented. Luckily, the Independent Commission on Children and Young People’s Mental Health has, over the last year, been monitoring progress. It already wasn't looking good after a report in July 2015 from Young Minds found that, contrary to the plans, £35 million was cut in just one year. The commission has now published its final report, A Time to Deliver, written by Emily Frith. And I don't think it's an exaggeration to say, especially as a parent, that so far, progress is nothing short of a national disgrace. The funding equated to £250 million a year, however the commission found that only £143m was released in the first year, and of that, only £75m was distributed to clinical commissioning groups (the local health groups that fund GPs and NHS local health services). Of this £143 million, it's not yet clear how much of this has been spent on frontline services, but reports from mental health providers indicate that they have not yet seen increased investment. Crucially, the funding for children and young people’s mental health has not been ring-fenced and so there is a risk that it will be spent on other priorities, such as those covered by national targets, like A&E waiting times. This single decision was putting the transformation process at risk. The Commission faced difficulties in working out what had been spent and where, because of the lack of transparency in how data on funding CAMHS is collected. This is just not good enough. First, this is taxpayers' money and there should be complete transparency in how it is spent. Second, it is allocated to help our nations' future adults, on whose taxes this generation will depend in years to come. So it's a false economy to cut them off before they've had a chance to succeed at life, isn't it? The report also highlights also widespread concern that council budget cuts have led to cuts in community mental health services (tier 2). The Children’s Society and others found that in the last five years local authority spending on early intervention services fell by 31 per cent in real terms. They estimate that the early intervention grant will see a 71 per cent cut by the end of the decade, a decimation in any terms. As mentioned, in the first year, of the expected £250m, only £143m was released, and of that only £75m was distributed to clinical commissioning groups. Findings reveal that two thirds (66.9 per cent) of young people aged 16-34 who had attempted suicide had not subsequently received medical or psychological help. Specialist mental health services are on average turning away nearly a quarter (23 per cent) of the young people referred to them for treatment. Workforce difficulties are a key barrier with 83 per cent of trusts that responded citing recruitment difficulties, with mental health nurses being the most difficult profession to recruit, followed by consultant psychiatrists. Many of the young people’s mental health services visited were experiencing increasing demand. For example, in Essex the number of referrals had more than doubled in a year, from 3000 to 7000 open cases. Partnership working across the child and adolescent mental health system was complex. Local health and care leaders had to overcome barriers such as overlapping geographical boundaries and different financial, procurement and governance timescales and protocols. Working in partnership with young people was challenging, including barriers in communication across generations and the transient nature of children’s lives. Changing the culture in existing services, or with staff transferred from previous services, was a particular challenge. Engagement with schools was a recurring concern within local services. These included the recent changes to the education system. More multi-academy trusts, each with different governance structures making it difficult for health staff to know how best to engage. Transition: Many areas visited were still challenged by the process of young people transitioning to adult services at the age of 18. While transition protocols were often in place, they were not always being followed. There were some positives. For example in Birmingham, they had moved the age of transition to 25 but recognised that a smooth process was still important at the new transition point. In Oxfordshire, CAMHS staff run weekly sessions within all secondary schools. Meanwhile Essex has developed a mental health app for service users. However, areas that had very ambitious plans emphasised the length of time it takes to embed new systems and working practices. A sustained focus on raising awareness and reducing stigma. An easy to understand web-based parenting guide for all parents. A strategy to empower young people to live safe digital lives. This should focus on developing young people’s resilience and critical thinking skills in the face of online threats, given the impossibility of eliminating all online risk. It should cover threats such as excessive internet use, child protection, websites promoting suicide, self-harm or eating disorders (e.g. sites that promote anorexia or bulimia ) and cyber-bullying. a stronger focus on mental health and wellbeing within schools. A clear strategy to ensure earlier access to appropriate care for young people with mental health problems from all local communities, particularly those who are under-represented in services (e.g. those with learning difficulties, black and minority ethnic groups, LGBT young people, or others who may fall within one or more of the protected characteristic categories). A trained lead for mental health and wellbeing in every school, college and university. Ofsted having regard to wellbeing in any inspection of a school or college. Areas should not receive their annual share of the additional £1.4bn unless they can demonstrate that they have robust plans to improve care and all the additional funding is being spent on children’s mental health and not offsetting cuts elsewhere. The practice of making a young person leave their support service on their 18th birthday must end and young people should be able to choose when to transition up to the age of 25 with support from their therapists and parents or carers. As I said, you must read the report to see these in full. These are good recommendations, and there is a checklist with some good practice recommendations for commissioners at the end. But this is the final report so who is going to monitor if anything is taken up and put into practice? It is indisputable that there has been both a significant rise in children and young people seeking help for mental health problems AND a significant treatment gap, with young people turned away from services or waiting a long time for treatment. 18 months after the start of "Future In Mind" this just SHOULD NOT BE THE CASE. It's indicative of a widespread failure of leadership, culture and funding priorities. It says to me that NHS leaders are not putting the child at the centre of care priorities and not even at the front of their minds. While this may be harsh judgement in some cases, as a whole it is clear that this is happening. What's WRONG with these people? Why are they putting barriers of, "that's how things are done here" in the way of children's health? If it ain't working for the people the services are there for - children - and it clearly isn't, then bloody well change it. Spread good practice, where it is found - have a way for staff and parents to highlight it easily so it can be examined and promoted. There is a massive amount of anger across the world right now for many different reasons. This is one more area where we MUST to stop thinking in silos and start thinking about how we those who are suffering the most - our children. It's not just the responsibility of the NHS, it is all our responsibility. It isn,'t just money that's needed, it's the will to change priorities and to put the child at the centre instead of the structure. What kind of society are we, anyway? This makes me want to cry. Sat and listened to all the MH/Nhs crowing at CDC conference – but couldn’t tell us then what would be put into education frontier part of plan …..school aspect of plan was funded by …er….schools? So sad because a beautiful YP I worry about (not SEN) is badly effected by this. Heard of others too. First there is school, LA and then even NHS inaction and jolly games of pass the parcel just when family needs stable caring guidance. We have a new building though to house MH in! The lack of response here has fuelled a smouldering fire that should have been damped a long time ago rather than left, KNOWINGLY, to develop into an inferno and recently requiring a&e intervention. Other sibs and family badly effected. What £ did they save? An entire family, several YP under one roof at risk. Where are social care? They also can’t meet demand. They are sooo old school. When will they start to practice what they preach?